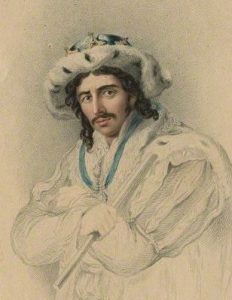 Who wouldn’t wish to have been able to experience the great Edmund Kean performing Shakespeare? He mesmerised his audiences and critic after critic tried to explain how he got his effects. The most famous of all descriptions came from the great poet Samuel Taylor Coleridge: ” Seeing him act was like reading Shakespeare by flashes of lightning.”. In the early nineteenth century the stage had been dominated by the great Kemble family, led by the stately and dignified John Philip Kemble. By contrast, Kean was small, dark and intense. In January 1814 he was given the opportunity to play Shylock at the Theatre Royal, Drury Lane, London. It was his big chance and he knew it. He caused a sensation and a couple of months later he took on Hamlet, one of the roles for which Kemble had been most famous, also succeeding in due course as Othello, Iago, Richard III and King Lear. We might expect that “flashes of lightning” quote to mean that Kean’s performance was unpredictable, with the excitement of finding new insights night after night. But it’s clear from reading descriptions that Kean’s performances were just as worked out, his effects just as calculated, as Kemble’s were. Instead of finding and following a consistent line, though, he chose to save himself for particular scenes. So in Othello he went through the first couple of acts with little effort, putting all his energy into the big scenes in Act 3 where his character was consumed by jealousy. All actors were known for their “points” within a play in which they created distinctive moments that they owned and that audiences came to expect. His most famous is one we would find strange today, and seems odd given Kean’s reputation during his own lifetime for womanising and drunkenness. His Hamlet, though, behaved more gently in the Closet scene towards Gertrude than the respectable David Garrick had done. At the end of the nunnery scene with Ophelia Austin Brereton describes how “Kean used to return from the very extremity of the stage, take Ophelia’s hand, kiss it with tender rapture, look mournfully upon her, with eyes full of beautiful significance, and then rush off the stage”. It brought the house down every night. The critic Hazlitt considered it “the finest commentary that was ever made on Shakespeare. It explained the character… as one of disappointed hope, of bitter regret, of affection suspended, and not obliterated, by the distractions of the scene around him”. 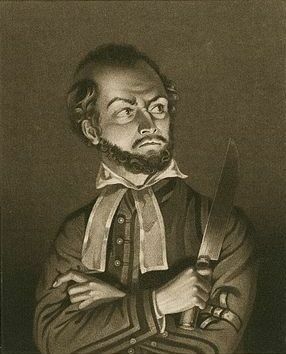 Kean’s performance as Othello was full of emotional power, but Arthur Colby Sprague notes that “nothing about it was fortuitous, nothing left unprepared”. When visiting a new theatre he would carefully work out exactly how many steps he needed to take across the stage while performing a piece of business or speaking a word in order to get the greatest audience response. As well as the moves, his vocal mannerisms were worked out precisely in advance. Actor George Vandenhoff wrote that in speaking, he “ran on the same tones and semitones, had the same rests and breaks, the same forte and piano, the same crescendo and diminuendo, night after night, as if he spoke … from a musical score”. Perhaps inevitably, Kean died young, collapsing on stage while playing Othello and dying a few weeks later aged only 46, in 1833. His fame had bought him riches, but he died in debt. His turbulent life, and the excitement of his acting, have often been dramatized in the centuries since his death. 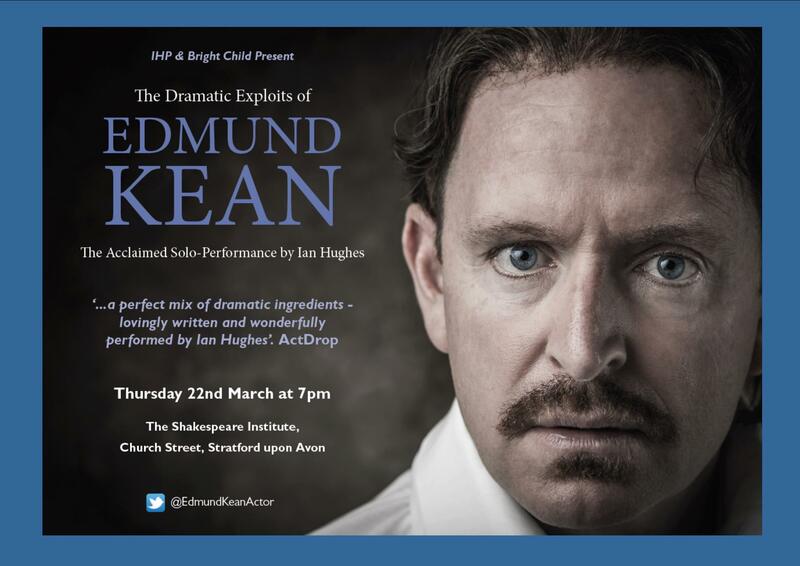 Ian Hughes is the latest actor to take on the challenge of playing this charismatic actor in his one-man play The Dramatic Exploits of Edmund Kean. Over more than ten years Hughes was a versatile RSC regular, his roles including Fortinbras in Hamlet, the Fool in King Lear, Autolycus in The Winter’s Tale, Thersites in Troilus and Cressida and Puck in A Midsummer Night’s Dream. Hughes first presented his show during a festival at The Other Place in Stratford-upon-Avon in 2000, and I remember being very impressed by the play and Hughes’ performance. In the intervening years Edmund Kean has obviously remained an obsession for Ian Hughes, and he is now taking the play around the country. He’s already done it at several venues including the Georgian Theatre Royal, Richmond, Yorkshire, where Kean actually performed. Now, at 7pm on Thursday 22 March 2108 Ian Hughes is returning to Stratford-upon-Avon to perform it at the Shakespeare Institute, Church Street, and all are welcome to attend. It promises to be a terrific evening. This entry was posted in Legacy, Shakespeare on Stage and tagged Edmund Kean, Georgian Theatre Royal Richmond, Ian Hughes, Royal Shakespeare Company, Shakespeare Institute. Bookmark the permalink.